 Cranberry and apple-stuffed Cornish hen. Here’s the recipe from Running To The Kitchen. Buttermilk-brined Cornish hen, trussed and ready to roast. Here’s the recipe from Kitchen Confidante. 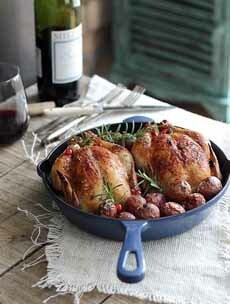 Cornish hen roasted with wine and herbs. Here’s the recipe from Drizzle And Dip. Cornish hens in the yard (photo courtesy Poultry Chiller). Tyson’s Cornish hens are sold frozen in grocery stores. When we were growing up, our Nana roasted a chicken at least twice a week. But on weekends and for special occasions, it was Cornish game hen—now simply called Cornish hen. Cornish hen is a not a game bird, like a guinea hen or a pheasant. “Game” is a misnomer, possibly added by retailers to encourage sales. Cornish hen is not always a hen—males are sold, too. It is a smaller chicken, a cross between the Cornish hen and the Plymouth Rock hen. The Cornish hen sold in the U.S. was bred in Connecticut. The original Cornish chickens are a large-size heritage breed* from the county of Cornwall in England. They are bred for their meat, since they are not prolific egg-layers. 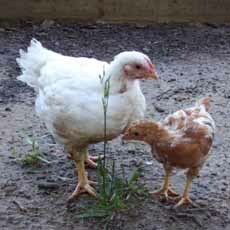 Cornish chickens, as well as crosses of Cornishes, are the most-used breed in the chicken meat industry. The hens take a long time to mature, requiring more feed/expense until they are ready for harvest. The American Cornish hen, also referred to as Rock Cornish hen and Cornish game hen, was bred in Connecticut in 1949 by Te (Alphonsine) Makowsky, who had grown up on a farm in France. After her husband retired from his manufacturing company in 1946, the couple moved from Long Island to Connecticut to start a chicken farm. It specialized in African guinea hens. After a fire destroyed the barn and the birds in 1949, Te Makowsky began cross-breeding chickens to try to come up with a bird that matures quickly, with an eye towards more breast meat. She came up with the idea of producing a small, plump “specialty” bird. Her idea was to breed the Cornish chicken—at the time the most popular breed in the world for broilers—with the American White Plymouth Rock chicken; hence the name Rock Cornish game hen. This combination gave her a chicken that could be harvested in less than five weeks, saving money on feed. It was petite—two pounds or less—making each bird one complete serving. It had succulent, tender meat, and a larger proportion of breast meat. Cornish hens have the same nutritional values and flavor as the larger broilers (some find the meat to be a bit milder). These hybrids are now sold as “Cornish hens.” The name “Cornish game hen,” which may have been a marketing description at retailers, has been dropped in favor of accuracy. Capon, a large castrated rooster that weighs 6 to 10 pounds, butchered at about 6 months of age. Capons have large breasts and more fat than most chickens, making them meaty and flavorful. 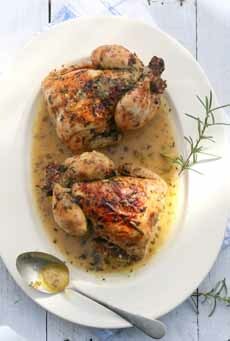 CHECK OUT THE DIFFERENT PARTS & TYPES OF CHICKEN IN OUR CHICKEN GLOSSARY. Due to their smaller size, they roast more quickly. They’re affordable yet festive. People love getting their own little chicken. You don’t have to carve: Each person cuts his/her own hen. Our Nana made a rice pilaf with pecans and a diced, roasted carrot and sweet potato blend with sage. Another favorite was sautéed mushrooms or mushrooms and pearl onions, with a splash of red wine added to the pan. There were also the de rigueur dinner sides of the day: a green salad and a green vegetable (in those days, asparagus, broccoli or green beans). Consider today’s trending foods: couscous or quinoa; broccolini, kale or Swiss chard. 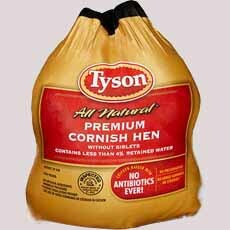 While many supermarkets may not carry fresh Cornish hens, check in the freezer section for Tyson Premium Cornish Hens. The all-natural birds have no added hormones, artificial ingredients or preservatives. 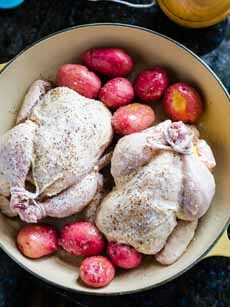 To cook frozen hens, place them breast side up on rack in shallow roasting pan. Roast, uncovered, basting frequently with butter for 1 hour or until the juices run clear when the thickest part of the hen is pierced and temperature on instant read thermometer reaches 180°F. If the hen weighs more than 1 pound 2 ounces, roast for an extra 15 minutes. *Heritage breeds are traditional livestock breeds that have been raised for centuries. In the modern industrial agricultural world, they are not cost-effective, and have been abandoned by mass growers in favor of other breeds or hybrids. Heritage breeds are still raised by small farmers, and are in demand by the finest restaurants.